One of the most charismatic European Commissioners, Margrethe Vestager was the "queen" of the European liberal group gathering in Brussels to present the "Team Europe" for the elections. Seen as one of the strongest names for president of the European Commission, the Danish politician spoke about her vision for Europe. "We have a very long "to do" list, with many problems, a lot of bad things are happening: rule of law, how to create jobs for the next generation, the climate change. But we need to use the energy that comes from what we have achieved. Europe is a good place to live when you compare it with so many other places, especially if you are a woman", she told Euronews. 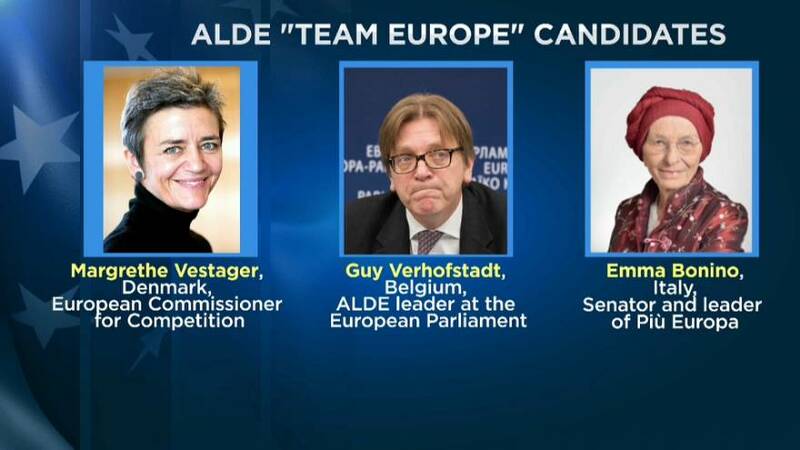 The European liberals did not choose a single candidate for leading the European Commission but presented a list of seven names, including Belgian Guy Verhofstadt and Italian Emma Bonino. The other four are nationals from Germany, Spain, Slovenia, and Hungary. A strategy that pleases the French President, Emmanuel Macron, who sent an envoy to the Liberal Congress, last October, to start a dialogue for a possible future coalition. Although in Brussels for an EU summit, Macron did not attend the event and his representative explained why the En Marche party has no delegate in Team Europe. "We have done that too much in Europe: to distribute job positions before the elections. For us, the important thing is that our ideas will rule in Europe. We want to speak in a broader way with progressive forces in the different countries, namely liberals, social-democrats, greens. We want to have a dialogue to find out who wants to build something with us based on a political project. We need to draft a project for Europe", said Stanislas Guerini, executive officer of La République En Marche. A coalition may arise only after the election results will be known, to reshuffle power in the European institutions. "Liberals are now the fourth force in the European Parliament and they expect to win enough votes to become that third, and somehow be kingmakers in the future coalitions in the European Parliament. With a strong message against populist. they want to defend a greater degree of European Union integration in a Parliament that will be much more fragmented", adds Isabel Marques da Silva, Euronews correspondent in Brussels.